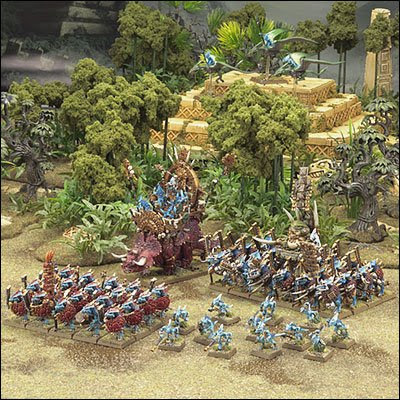 Fields of Blood: Where to for Lizards? All the tea leaves are saying that Lizardmen are the next Fantasy book and that it could be as soon as next month. I personally think that Lizardmen are the strongest book in the game - this has evolved due to the nature of 8th Edition and with the release of new books over time. The killer books of 7th have been de-powered with an 8th ed update. Why are Lizards so strong? Well because they compete in every phase and I hope that this is one aspect that they don't change with a new release. So what has to happen and what would I like to see happen? The answer is, surprisingly, not too much at all. The key issues for me are that we see more of a reason to take Saurus over skinks. For the tigers, skinks are currently the way to go. Learn how to double flee and then sit there blasting away with either two Slaan or a souped-up party Slaan. I would like to see more of an incentive to take Saurus over skinks. It doesn't need to be much of a nudge - Saurus are already a good choice - so can probably be through a small nerd to skinks. How would I do that? Probably by retaining cold-blooded but not allowing them to use General's Leadership. The other things I'd like to see are a fix for Temple Guard and Kroxigors. Both are rarely seen these days and that is a shame. These are the Lizzie Elites and there has to be some slight nudge up in terms of power. One might be to provide the TG to buy an item that gives them protection from miscast damage while with Krox I'd increase their Scaly Skin save to 3+. The final two things I'd like to see is a sorting out of M&H rules for Salamanders by change to Sallies rules. The free ward they get now makes them a non-brainer. And some sort of push for the Stegadon the big monster has become the forgotten reptile of the Warhammer world. It will be interesting to see what GW do. Agreed on most of your points Pete. I don't mind seeing individual units change at all and am fully expecting the demise of the skink cloud as the list it currently is. What's important to me though is that the book remain dynamic and lets me play in every phase of the game in a meaningful way (a big ask I guess but that's what makes the army exciting for me). I like the idea of Skinks not using general's leadership and think this is a more elegant fix than nerfing skinks into gnoblar-dom like half of the internet wants. All in all I think that GW has done a pretty good job with all of the 8th books bar TK and increasingly OnG so am excited for a new book and new toys. I'd love to take my old lizard list, carno lord & big units of saurus blocks with dinosaurs. Maybe increase the oldblood ld to 9 to be more viable. I'd like to see some improvement in saurus cav anything really. Maybe allow skink priests access to 1 or 2 other lores of magic. I agree with Jossy. Think we'll see some monstrous cavalry, something that flies and pack punch, (trenadon chariot, anyone?) more expensive skinks, and probably a reason to take the stegadont or a new buff-machine of sorts. Reasons to spend a lot of money on monstrous kits. The machine grinds on relentlessly. Damn those Trenadon chariots are going to hurt..... I think the Engine will go the way of a bound spell like the warshrine. Stegs need to get cheaper. Skink costs will go up. Slaan will go up with some new funky rules. Maybe Salamanders will work like hydras as in all damage dealt hits the Hydra only? Saurus cav to get a boost, not sure how. Lances? I am really liking the amount of books GW is producing at the moment, it's really good for the game. Given the way the 8th books are developing I would be very surprised if Slanns keep Loremaster, and free extra dice and miscast protection. What they do with Slanns will be the most interesting change. they will reuse the Phoenix kit because we all know dinosaurs were feathered. - As 'the' premier wizzards of the Old World, I expect Slann to get everything that the HE mages/loremasters get, plus the effect of the cool HE magic items, plus some lizzardy extras (e.g. Cupped Hands x unlimited, Bane Head) as standard abilities for no change in existing points. - Due to their cold blooded affinity, Cold Ones ridden by Saurus are no longer Stupid. - Terradon chariots are just silly - who would have those?? I agree about the stupidity thing. Wondering if they would do a hero that has the same sort of stupidity mitigating effect as Malus Darkblade and Spite. I suspect strongly that some flying dinosaur model will be in the offing. yeah, my money's on the big base monster & m/c, as per most other hardback ab's. maybe a sallie sized monster in the mix? oh, imagine a plastic multi choice kit for raz/sallies.. thats some serious wishlisting right there.